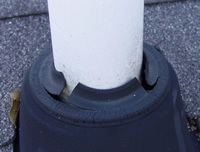 The Perma-Boot is a gasket-less two piece pipe boot repair system designed to permanently repair the most common type of roof leak - the leak around the vent pipes that penetrate your roof. What problem does the Perma-Boot solve? 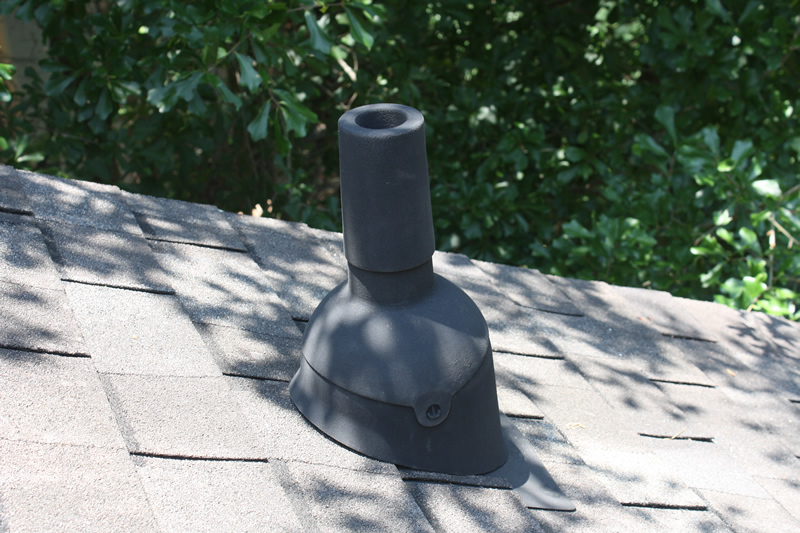 The plumbing vent pipes that stick out of your roof are often sealed with a rubber pipe boot to keep rain from entering your home. These rubber boots deteriorate when exposed to the sun and high temperatures on the roof causing them to crack and leave a gap where water can enter the house. While your roof shingles might last as much as 30 years, these rubber boots usually deteriorate in as little as 3 to 5 years. Once that happens, water begins to flow into your attic and cause water damage to your ceilings, interior walls, and drywall. Typically, the first sign is a large water stain on a ceiling. Can I fix my leaky roof vent boot without a Perma-Boot? Until now there have been only a few options for repairing these cracked boots and none of them offered a permanent solution. 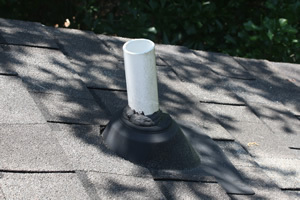 One option is to hire a roofing contractor to replace the entire roof vent boot. This can be quite expensive, and will be required 3 or 4 times over the life of the roof. In some cases, replacing your existing roof vent boot requires removing and replacing the surrounding shingles. Roofing shingles can be difficult to match as the old shingles will have been discolored from exposure, and the the resulting patch can be an eyesore. The most common solution is attempting to re-seal the boot with roofing caulk. Roofing caulk isn't likely to bond very well with the weather damaged rubber boot, and is even less resistant to UV damage than the old rubber seal. As you can see, this type of repair isn't going to last very long. Perma-Boot is the solution for homeowners who want to fix their leaky pipe boots forever. Download the Perma-Boot spec sheet or Perma-Boot product warranty.